Whiskey is a grain-derived alcohol that is created by fermenting rye, barley, wheat or corn. People all over the world make and drink the different varieties of whiskey, and each whiskey has a distinct taste. 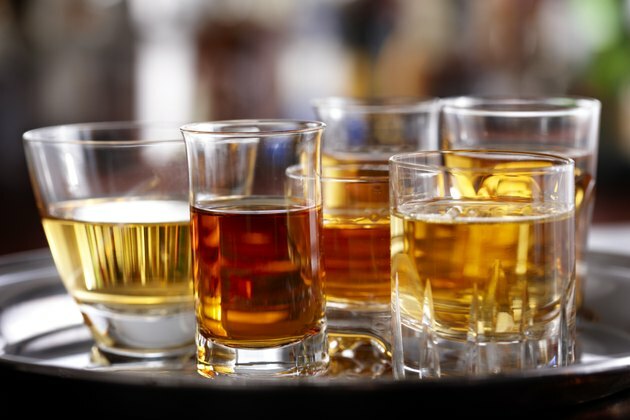 Although any type of alcohol can be deadly in excess, the medical community has found some health benefits to drinking moderate amounts of alcohol, especially whiskey. The U.S. Department of Agriculture states that a 1.5-oz. shot of whiskey does not contain any fat. For most individuals, a healthy diet is considered one that is low in fat. A 1.5-oz. serving of whiskey contains only 0.04 g of carbohydrates. This is in the form of sugar -- a simple carbohydrate that your body breaks down and uses immediately for energy. Dr. David J. Hanson of State University of New York states that people who consume one or two alcoholic drinks, including whiskey, daily have a 50 percent lower chance of having a stroke or developing dementia in old age. This moderate amount of drinking can also decrease the chance of developing diabetes by 30 to 40 percent. These benefits come from alcohol's ability to increase good cholesterol and decrease blood clots. Alcohol contains ellagic acid, an antioxidant that destroys cancerous cells. According to a study presented by Dr. Jim Swan and colleagues at the 2005 EuroMedLab conference in Glasgow, Scotland, whiskey contains more ellagic acid than other types of alcohol, providing even more cancer cell-fighting antioxidants.